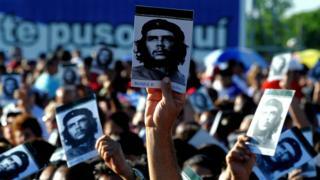 Several thousand people have attended a ceremony in the Cuban city of Santa Clara to remember the revolutionary icon Ernesto "Che" Guevara, 50 years after his capture and death. Among crowds at his statue and mausoleum was his old friend, Cuban President Raúl Castro. Many more watched at home on state TV as President Castro laid a white rose on Guevara's tomb. The revolutionary still divides opinion as much today as he did in life. For five decades his name has adorned every corner of Cuba, from banknotes to billboards, his image one of the most recognisable in Latin America. The people who turned out in Santa Clara - the city synonymous with his greatest victory in battle - clad in Che T-shirts or holding up his image in pictures, think of him as nothing less than a hero. They came to celebrate the charismatic, uncompromising Argentine they adopted as one of their own. "We hold him very close, we have him near us always. We know what Che represents to Cubans, to Latin Americans and to the world. For us it's a great honour to have his image on our chests and in our hearts," said one man. An excerpt of Fidel Castro's speech in 1967 announcing the death of Che Guevara to the Cuban people was played in which he famously urged Cuban children "to be like Che", a slogan that endures today. Judging from the number of schoolchildren in the audience, Guevara's life will remain a crucial part of the education of young people in Cuba for decades to come. His supporters see him as an example of commitment and self-sacrifice, his critics see a man they consider brutal and cruel. But whether he's considered a fearless hero or a bloodthirsty radical, one thing is sure - he was part of a generation that is coming to the end of its time in Cuba. Fidel Castro died last year and most of Guevara's comrades who turned out for this event are in their 80s. President Raúl Castro is due to stand down next year, a moment that will see someone other than a member of the Castro family at the helm in Cuba for the first time in almost 60 years.